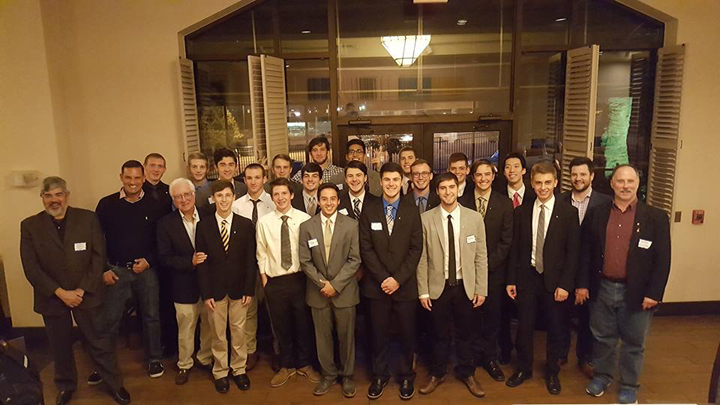 After a two-year absence, Pi Lambda Phi is back on campus as an officially recognized fraternity. The fraternity has spent much of the past 20 years under University suspension — Pitt suspended the group most recently in 2014 for supplying alcohol to a minor. National recruiters came to recolonize Pi Lambda Phi on campus this year with the intention of starting fresh, with new brothers, new leadership and a renewed dedication to its creed. The organization is trying to move on from a turbid history at the University. The chapter first lost its place on campus in 1996 when a police raid of the house discovered drug paraphernalia. The fraternity sued the University and the city, along with individuals, for blaming the whole chapter for the actions of several students and subsequently “stripping” the chapter’s status, according to a case report. After the District Court ruled in favor of the University, the chapter appealed the ruling, which was upheld in the U.S. Court of Appeals. Just one year after Pitt reinstated the fraternity in 2013, it was booted again. Officials from the University would not confirm the 2014 incident, but Lowe; Alex Doyle, a former brother and John Palasits, a recruiter on the professional staff, all said it was due to a non-brother who returned to Nordenberg Hall drunk after a Pi Lambda Phi party. The University Office of Cross Cultural and Leadership Development, the Office of Student Conduct and Kenyon Bonner have declined to say specifically what the fraternity did to assure Pitt administration that it is ready to start clean this year. Even so, Pi Lambda Phi in its newest iteration currently has 20 new brothers — none of whom are previous members — and plans to have 25 to 35 by the second semester. “We are really accepting of everyone, and we just want to make a true difference here and try to be the best fraternity and organization on this campus at creating change,” Serbin said. The fraternity has built itself — through its service activities and on-campus involvement — on eliminating prejudice since its inception in 1895. At that point, it was the first nonsectarian fraternity in the United States, according to the fraternity’s national organization website. This mission is what originally attracted then first-year Alex Doyle, a junior biology pre-med/pre-vet student, who was a brother in 2014. He said the atmosphere of Pi Lambda Phi initially attracted him to the fraternity. “Everyone was really friendly –– the crowd of people at a Pi Lambda Phi gathering had a sample from nearly every demographic of student, whereas at a normal frat party the crowd is fairly homogenous,” Doyle said. Pi Lambda Phi’s shutdown upset the morale of the 2014 group, according to Doyle. After an initial misunderstanding that they would be allowed to rush this year, the former brothers were eventually denied based on a Pitt policy barring them from rejoining. “We aren’t allowed in now because of some things a kid none of us knew did two years ago,” Doyle said. Instead, 20 brand new members have joined the recently reformed chapter, updating the group’s status this October from colony to chapter. Serbin and his twin brother, Zach, were among the first students to join the chapter’s recolonization, but Serbin said the fraternity plans to have between 25 to 35 members by the end of this semester. After helping out with the Step Out: Walk to Stop Diabetes on Oct. 1, the Pi Lambda Phi brothers took on Homecoming week, handing out spirit beads –– Pitt-themed necklaces –– with the sorority Sigma Delta Tau. They also plan to partake in Pitt Make a Difference Day on Oct. 22. Serbin said he joined hoping to make sure that motto sticks at Pitt and isn’t sullied by the fraternity’s reputation on campus. “My lasting impact I want to leave is to create a legacy here for the next Pi Lambda Phi to come on to and to really create a good fraternity on campus that doesn’t have a negative connotation,” Serbin said. Pitt’s silence on Pi Lambda Phi’s re-installment highlights the University’s closed door, case-based suspension and readmittance system. According to the list of University-affiliated social fraternities and sororities on the Office of CCLD’s website, one fraternity –– Delta Tau Delta –– is currently on interim suspension while its charges are adjudicated and two organizations –– fraternity Iota Nu Delta and sorority Theta Nu Xi –– are inactive. No social fraternities or sororities are suspended, according to the list, and 38 are listed as in good standing with the University. Pi Lambda Phi does not appear on the list as of Oct. 20. Summer Rothrock, interim director at the Office of CCLD, said the length of an organization’s suspension depends in part on the violation that got the group suspended in the first place — but would not confirm for what violation exactly Pi Lambda Phi was suspended. According to Rothrock, the CCLD office does not track how many fraternities or sororities have gotten kicked off Pitt’s campus. Punishments for fraternities and sororities are handled on a case-by-case basis, she said. Pitt does not outline specific details of suspension or reinstatement requirements in a standard discipline system for Greek Life groups. Instead, their suspension process is governed by the same general guidelines as any other student organization. Rothrock also said there is no set regulations or policy for how long suspensions should be for certain violations. “The time is always set by the Student Conduct Process, so it’s going to vary from fraternity and sorority,” Rothrock said. A chapter must obtain a letter of endorsement from the Interfraternity Council, National Pan-Hellenic Council or Pitt’s Pan-Hellenic Council. After a chapter has received the letter, it may petition to the the vice provost and dean of students for permission to recolonize. In a petition for reinstatement, a fraternity or sorority must document its progress since its suspension for the vice provost and dean of students. This documentation includes a working relationship with the Office of Fraternity and Sorority Life, meaning the office must know who the leaders of the organization are and their intentions to file a petition for reinstatement. Those leaders also must be able to articulate the mission of their fraternity or sorority, they must have a faculty or staff member that plans to work with them on academic progress and they must meet the liability insurance requirements required for all fraternities and sororities. The vice provost and dean of students –– Kenyon Bonner –– may assess the degree to which the chapter has fulfilled the terms of its suspension, as they have the ultimate authority for the decision. But Bonner would not comment specifically on how Pi Lambda Phi’s suspension length was determined or on how the length and requirements of any Greek Life suspension are determined. In an email on Rothrock’s behalf, Student Affairs spokesperson Shawn Ahearn declined to comment on what conditions led to Pi Lambda Phi’s suspension or its reinstatement. Ahearn said they could not discuss the details of specific cases. Rothrock said in an email that the Office of Student Conduct maintained detailed judicial records, and fraternity and sorority life maintains all organizational judicial status information. Barbara Ruprecht, Pitt student conduct officer, confirmed the Office of Student Conduct keeps records of all violations of the student conduct, including but not limited to behavior of fraternities and sororities. Ruprecht declined to elaborate on how fraternities or sororities are suspended or reinstated, beyond what is outlined in the Student Code of Conduct, and did not elaborate on the office’s involvement in Pi Lambda Phi’s suspension or reinstatement. The University and the chapter have agreed to move forward, despite the chapter on Pi Lambda Phi’s past — and the details on just how it’s changed for the better — still remaining vague. Matthew Richardson, coordinator of Fraternity and Sorority Life, said that because Pitt doesn’t want to make suspensions regular occurrences, the University doesn’t document fraternity suspensions and readmittances. “It’s obviously reactionary to situations that happen so, no, we don’t average them because, again, it’s not something we’re trying to have as a metric, a benchmark,” Richardson said.